We had a second storm roll in just before dark, but unfortunately I couldn't chase it as the missus decided to see some of her friends, so therefore I was in charge of cooking dinner. Anyway I set the camera up out the back door and hoped for the best. The storm looked impressive with a guster, but taking photos from my vantage point was useless!! The first storm dropped 7.7mm and the temp plummeted from 20c down to 11c, once the storm passed the temp slowly rised to 13.6c where it remained for the rest of the day. 2nd storm pretty well died as it arrived and only 3.4mm fell. Radar starting to fill up nicely. Not long before the wet stuff arrives, it will be moving quick with the wind gusts picking up. Yes, there looks to be a large area of rain down south moving inland a good way as well,should make the Hunter about mid-night on. A mate on his way out to orange had encountered snow. Not exactly sure where of his location whe posting on FB. I note it's raining at Mt Boyce at under one degree. There must be a few flakes among that. Interesting signature on the Sydney doppler radar at the moment - could it because the radar is looking at two different layers of wind? Yes WJ certainly cold today, in fact bitterly cold. It's mostly fine here with grey clouds out to sea and blue sky to the west. I highly doubt it'll rain today. SSW'er pushing action offshore. Yes think you prob right reilly. The SWester picking up here just now and sun just broke free of cloud but gone again. The low off mainland appears to have been fended off by high. Otherwise it may have been much more interesting. Tomorrow could see some nice left hand barrels provided a good bank or even better a shelf. Banks are crappy at my two local beaches at present although one has a left hand shelf break that could get a clean barrel and the other a protected from southerly swell corner that might get a right off a bank but wind would mess it a bit. Wonder what ECL history is for September. Common or rare? What a wild night that was, I have no doubt that winds gusted up to 90kmph. 19.2mm fell in the 24 hrs to 9 am this morning, just as my backyard was starting to dry out, it's saturated again!! WJ should be happy cold with SW winds, although winds here are more from S-SSW here, currently no sun, temp a balmy 9.6c with a wind chill of about 6c. Time to check out the surf. Still howling along the coast here, every second garbage bin has blown over, swell is rather impressive, so much so we had a tow in surfer putting on a show. Jimmys beach is in all sorts of trouble, it has lost about 6 metres of beach and is only about 2 metres from the road. Council at this stage aren't dumping sand!! Here are a couple of pics of Jimmys beach. Wow Eddy that erosion sure is bad... Let's hope they start dumping sand soon! 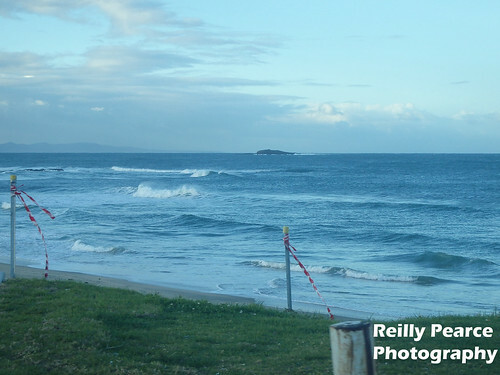 This first photo was taken at Port Kembla Beach, which faces SSE. 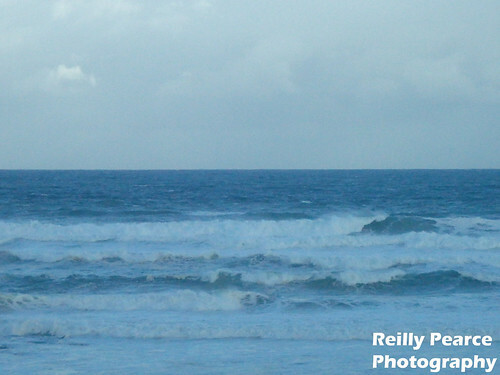 I believe the waves were about 7-8ft on the beach, maybe about 9ft on the reef. Heaps messy and dangerous. This photo was taken roughly at the same time (5 mins later) about 2 km north of Port Kembla beach, at MM Beach which has a NE'ly aspect. The conditions were completely different here with the SW'er acting as an offshore making glassy conditions and tiny waves in contrast to Port Beach with waves only averaging about 2ft with the occasional 3ft set rolling in. Sorry bout the ropes and pole in the way. I took the photo from inside the car. Sand loss at Jimmys pretty intense Eddy. I heard a man made reef was maybe on the cards to inhibit the sand moving about. Water movement dynamics and how to deal with sand movement has changed a lot. Groins used to be the favoured approach but they frowned upon now I think. Pretty messy breaks reilly. Same up this way. Short period swell. WJ a artificial reef has been on the tables for many years now, not sure if that's the answer, have heard that all a reef will do is move the problem somewhere else!! I imagine it will be big news around the Hunter come tomorrow morning if nothing has been done overnight. If you have a look at my Flickr page you will see some pictures and a short 30 sec video of the surf at the main beach and Jimmys. Yeah Eddy I saw them, really nice photos, especially the one where the lip hasn't touched the surface! Yeah I don't think an artificial reef will help at all. WJ- Funny how we have completely different opinions regarding the last para. I want spring weather to come as quick as possible, as yesterday's weather was absolutely bitterly cold, and miserable especially when it rained a couple of times through the day! Coldish breezy night..Juicy cloud offshore and now SW and west. Crisp in the wind. Some nice spring warmth next week Reilly. Hope some swell still about to compliment offshore winds. So far Sep feels like Mid to late Aug we didnt have due to onshore winds. Nothing I used to love better than feeling the spray hit you as you were paddling for a nice wave with cold westerly holding the face up in August. And after a long sesh till dusk walking home to find one of dear old mums stews or soups or casseroles set for me on the table. Piping hot and full of good stuff. Memories. Coldish breezy night..Juicy cloud offshore and south. Crisp in the wind. Yeah lets hope there's some nice surf with offshore winds. By the time the warmth comes (Mon, Tues) the surf will probs be clean 2-3ft, which is perfect in a shore dump. I will be considering going out then because the water isn't extremely cold. It's bearable once you get in. Today should be similar to yesterday, with icy SW'lies, but except there is probs less chance of rain today. I'd say 30% chance of a shower today, here in the Gong. Good frost here this morning. Going to be a nice day with some very high cloud. Cool to cold here at the moment with a light shower happening,from south,cool to cold light SW to south winds. Generated in 0.450 seconds in which 0.435 seconds were spent on a total of 14 queries. Zlib compression disabled.